Over the last several weeks I’ve received a lot of questions regarding daily fantasy college football. These have to do with specific picks, strategy and college football in general. Since I’ve just been doing picks articles, I want to take this time to share some of the questions and answers in hope that it will help everyone (these questions are paraphrased to some extent). Q: You were only giving a few picks for each position to start the year, now you’re giving out a ton of them! I don’t really know much about college football, how can I decide which ones to use if I’m only making one or two lineups? 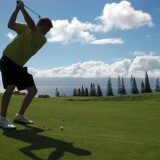 A: Learning a new sport is challenging from a DFS standpoint. Unfortunately, it’s especially difficult when it comes to college football. There are 128 FBS teams, around 40 games on a Saturday and it’s only divided into two segments (day and night). The first article I did was on the opening Thursday night when there were about a dozen games. Therefore, it was easier only picking a few guys at each position and a lot easier for everyone to make a lineup. I tried to keep it a bit of a smaller list Week 2, but two problems emerged. 1. Because there are no kickers or DSTs, we had multiple people with the same lineups. 2. I always felt like I was leaving a few people out who certainly could be in play. Keep in mind when we usually do our NFL picks/discussion in the forum, or any of the other sports, we have multiple people bringing input on who they like. It’s also a lot easier for the average NFL fan to know who certain players are and not hesitate to use them even if we didn’t really mention them. So, someone may use our top NFL picks and then combine them with their own guys. However, most people coming for college football help is looking for entire lineup constructing. It’s simply because the average person doesn’t know some basic things about college football teams, their tendencies, strengths, weaknesses, injuries, how rankings are irrelevant, etc. My goal is to include players at every position at different price ranges so those who make dozens of GPP lineups have the range of players. Basically, I don’t want someone to go off who is not on the list (while admitting some random wide receiver at minimum salary could still catch five passes for 50 yards and two touchdowns randomly). For people who are newer, I recommend being active in the forum and ask questions. I am always happy to try and answer people’s questions or help them improve their college football knowledge in general, but in the interest of giving people good players to use, I try to keep it efficient. Q: What college football statistics and data should I be looking at? A: Before I answer this, remember, all statistics must be put into context. No statistic is meaningful without being able to apply it correctly. There are a ton of meaningful statistics in college football, but for DFS, there are 10 statistics I look at. They are divided into three sections. Plays per game is as simple as it sounds. By seeing how many plays a team runs in a game, you can see how fast they play and how often their offense is on the field. Yards per play is a great way to see how effective an offense is on a consistent basis. Remember, yards per game is a fickle number. That can change drastically based on field position, turnovers, special teams variance, defensive/special teams TDs, time of possession, red zone variance, field goal variance and more. Yards per play will show more consistently how well an offense moves the ball. By combining plays per game and yards per play, you can detect how successful an offense is and how fast they play. If you get a good ranking in both categories, they are one of the best offenses for DFS purposes because they run a ton of plays and move it effectively. If you get a good ranking in plays per game but a bad ranking in yards per play, that means the offense is playing up-tempo or the defense is really good in getting the ball back to the offense, but the offense isn’t very effective. If you get a bad ranking in plays per game but a good one in yards per play, that means your offense plays at a slower pace, but is effective in doing so. If you get a bad rankings in both statistics, that means you have one of the worst offenses for DFS and likely in college football. Section two has four statistics: Rushing yards per game, rushing yards per attempt, rushing yards allowed per game, rushing yards allowed per attempt. Obviously you want to see how a matchup looks, so that’s why we have offensive and defensive categories. However, why have yards per game and yards per attempt? For all the same reasons listed in section one. But furthermore, it has to do with game flow. For example, if a team is really good and often leading by double digits, they are likely to run the ball more. So, maybe that team has really good rushing yards per game, but their rushing yards per attempt is average. That way, when that team goes on the road and is an underdog, you’ll know they may not have the greatest matchup. Section three has the last four statistics: Passing yards per game, passing yards per attempt, passing yards allowed per game and passing yards allowed per attempt. The reasons for using these are the exact same as listed in section two. Now that you know what to look for, there’s another key step – use the Vegas lines. Take a look a spreads and over/unders. See what teams are projected for and where the most favorable matchups are. Q: Why don’t you do Thursday/Friday articles? A: A vast majority of Thursday and Fridays only have a handful of games to choose from. I don’t think it’s very profitable to play in those contests. The exceptions to this are Week 1 (there are always games spread out over Labor Day weekend), Week 9 (that’s this week, for some reason there are several Thursday and Friday games this week) and Week 13 (this is Thanksgiving weekend and there are a lot of games on that Friday). I think you’re better off focusing on NFL THursday contests. If you really want to play weekday college football games, feel free to ask me a question in the forum or on Twitter @NickJuskewycz. Q: College football is really overwhelming. I know football really well, but I feel like I’m making picks blindly. How can I learn more about the sport? A: This is probably the question I get the most. Unfortunately, it’s not an answer your’re going to want to hear – it takes A LOT of time to learn the teams, programs, conferences, recruiting, little differences between college football and NFL and quite frankly, how the world of college football really works. Dealing with 128 teams (or at least a good chunk of them on a week-to-week basis), following injuries, getting injury/starter information on game day is tougher than it is for NFL, apply strength of schedule to give perspective to statistics, etc, can be a huge headache. The best I can say is watch, read and research as much as you can. I’m always up for a college football discussion, and I will typically have opinions or views that aren’t what you’ll hear on television. I’ll say this though – I believe college football daily fantasy is one of the most profitable sports by far. The average daily fantasy player’s knowledge isn’t that strong. Even with the regulars, I’ve noticed a lot of their opinions or picks are largely based on solid data, but they don’t necessarily have the team and overall college football knowledge to apply the data appropriately. If you’re willing to put in the time, its can be very beneficial, but it’s not easy. If it’s too much, just keep riding it out with the picks articles and participate in the forum. Q: Is there a lineup building strategy I should be using? A: Another very popular question. Simple answer though – no. It completely depends on the week and wave of games. I was recommending using running backs on DraftKings in the flex, but since they have dropped the prices on wide receivers some, it’s perfectly fine to use both positions there. Q: What’s been your beef with Baylor lately? A: There’s such a thing as too big of a spread in college football. Baylor was -46 at Kansas. As a result, Seth Russell only threw for 246 yards and three touchdowns before the backups came in. Baylor won 66-7. Baylor was -20.5 against West Virginia. Russell not only threw for 380 yards and five touchdowns, but he also ran for 160 and a touchdown. Corey Coleman also went off for 10 catches, 199 yards and three touchdowns. I have watched every Baylor game except their matchup against Lamar, inexplicably, defenses haven’t been putting a safety over the top on Coleman. Yes, Baylor has playmakers everywhere, but for how often Coleman is destroying people one-on-one, what are coaches doing in their weekly preparation? Last week Baylor was -36 against Iowa State, it was a ridiculous downpour and the line was dropping heavily lower as we got closer to game time as a result. Between the weather (there were reports that lightning would come into a play and a game could be shortened), over/under dropping, spread being too big, thinking Iowa State would learn the lesson in at least putting a man over the top on Coleman and that the players’ prices spiked, I was supporting fading Baylor players with playing Shock Linwood in GPPs since Baylor would likely run it more in the rain. Out of the gate, Iowa State ridiculously left Coleman one-on-one and Baylor scored immediately. But finally by the second quarter, they started putting a safety over the top. Yes, Russell did end up getting hurt (and is now unfortunately out for the season) to go with 64 yards on the ground with a rushing touchdown, but Russell was only 16-of-37 for 197 yards and tossed two touchdowns to go with one interception (that interception was a deep ball to Coleman that was a can of corn right into the safety’s hands). Given Russell’s price and that scenario, it was the right move to either fade him or use him very little. 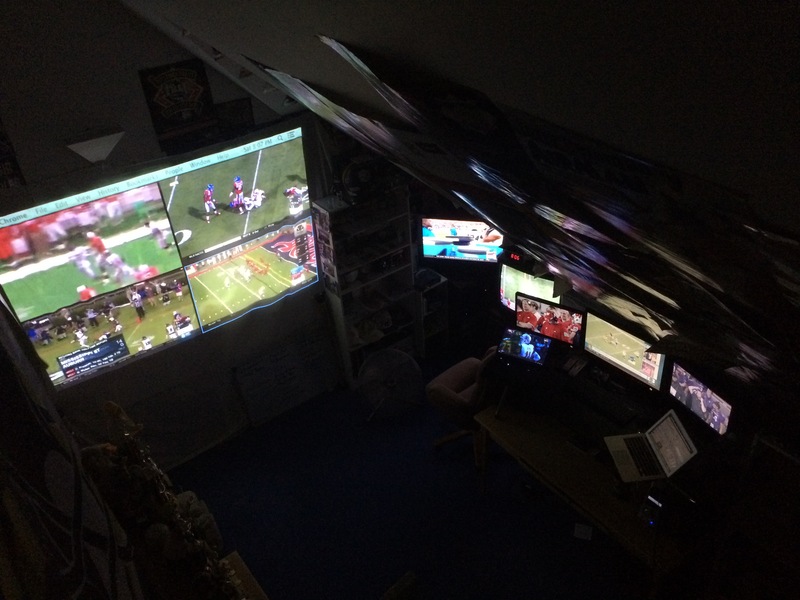 Q: How do you watch all these games at once? A: The truth is while I have anywhere from six-to-10 games on at once, I’m realistically only watching three or four. I modeled my college football viewing habits after Phil Steele. He has 16 games on at once while focusing on a main four games. I do the same, but on a smaller scale (I also don’t have a staff like he does). Working left-to-right here – the four games on the projector are connected via HDMI from my laptop that’s on the far right. That laptop is the only screen not showing a game, which is TweetDeck to get news and tweet my annoying rants. These games I’m not paying too much attention to. They are the least important games and often just to glance at between plays or watch during commercials. The TV next to the projector screen is my main TV that has DirecTV. The biggest game goes there and has my main attention. The TV to the right is hooked up to my Xbox, and that has the second biggest game. The three monitors on top of the desk are all hooked up to my desktop, and those have middle-of-the-road importance (depending on the wave of games). The little screen on the desk on the left side is an old laptop that I use for a less-important game. Obviously the fewer games you watch, the more you learn about them. But as long as you have a method and prioritize, you can grasp a solid understanding of a few at once while making sure you see good moments of some of the others.